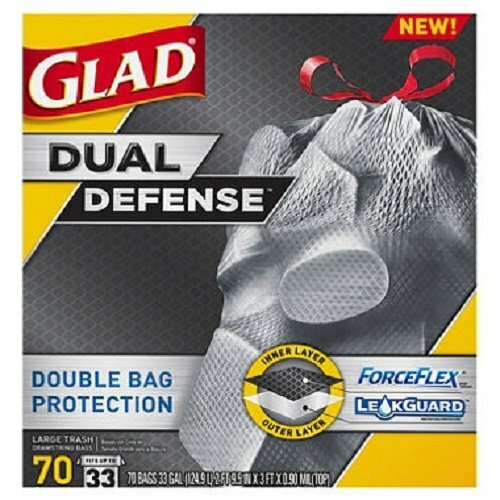 Glad® ForceFlex® Dual Defense Trash Bags can handle big trash loads with ease. These large garbage bags have a special dual-layer construction for double-bag protection. Made with the unique diamond texture of ForceFlex technology, the inner layer stretches around objects to provide durability and strength. The outer layer is built with LeakGuard protection to help prevent tears, punctures and defend against leaks. The 3-ply drawstring grips the can so the bag stays in place, making it easy to close, lift and carry out. These strong, durable large trash bags fit up to a 30-gallon size trashcan.